Know the email address of a missing Alum? Click here to contact them! 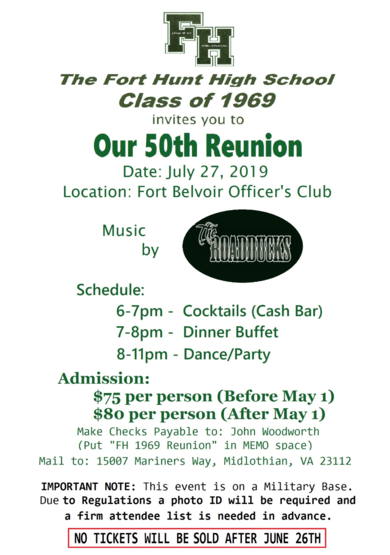 Friday, July 26th through Sunday, July 28th is the FHHS All-Class Reunion Weekend. Save the Dates for our annual gathering. Milestone Years: Class of 1969, Class of 1974, Class of 1979 and Class of 1984. We have our usual weekend full of activities - Check back here for details. Has your email address changed since registering? Having trouble logging into the site? If you know your password, simply login as you did before, (using your old email address). Once logged in, you can update your Login ID with your new email address by visiting the "Edit Contact Info" page under your MEMBER FUNCTIONS in the left-side navigation. FHHSAA site notifications have bounced back from more than 400 members' email addresses. Please make sure your info is current and, if prompted upon logging in, follow the instructions to reestablish verification of functioning email address. Please help us locate missing classmates! Although our beloved high school is renamed and repurposed, FHHS will exist forever in our hearts and minds. We represent our old alma mater through our communal thoughts and memories; collectively reconstructing an institution stronger than the physical structure could ever be. Our high school was only in existence for a mere 22 years. Twenty-two. Amazing. Years. Our parents and faculty--indeed, our whole community--produced an outstanding collection of entrepreneurs and leaders among our graduates and we continue that course, today, through our children and grandchildren. Sadly, our school's alumni membership will shrink with time, but we hope that our achievements will not be forgotten. By welcoming family and friends of FHHS as members of our Association, we enable our legacy to live on through those who share our vision. In particular, community programs and sponsorship awards that we establish and maintain might continue to grow and flourish. Indeed, the Federals' spirit will live on through this Alumni Association! To family and friends of FHHS who wish to join our alumni association: in order to expedite the verification process, please have a current registered alumni or faculty member sponsor your membership by emailing, on your behalf, your name and contact information to the website administrator. Thank you! Passwords are required to view certain pages in the left-side navigation links. In particular, those pages to which alumni contribute private content -- such as photo galleries and forum discussions. Registered site members must LOG IN in order to view protected pages. 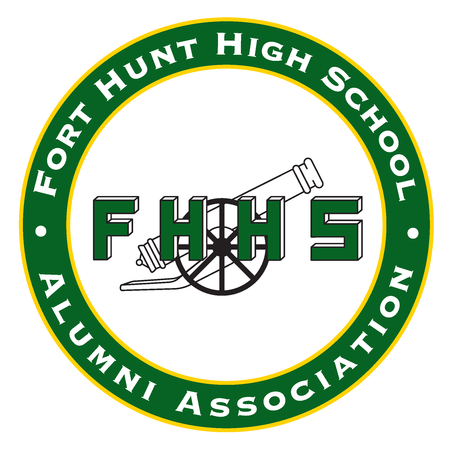 Welcome to the Fort Hunt High School Alumni Association! Your one-stop site for all your Federal needs! Welcome to the Fort Hunt High School Alumni Association website! Please have a look around this site, update your contact information, check out your classmates' profiles and pictures, drop a line in the Federal Forums, and peruse fun historical facts, photos & music from our many good ol' days! To foster, promote and maintain the spirit of Fort Hunt High School by serving as a central source of information about the school, its alumni, faculty and former students, to maintain this website (http//www.fhhs-alum.org) and to promote regular reunions of alumni, students and faculty members. In addition, the association will conduct a scholarship program to deserving, college-bound seniors at West Potomac High School and provide support to the local community. Click the Play button (>) below to hear the Federals' fight song performed by the Fort Hunt Marching Band, as recorded by Mr. Joe Neigh and later digitized by Sharon Fitzgerald Weisner for Celia FlorCruz. What happened to the "Hits of 1963-1985" Playlist music player? "Sadly on July 1, 2013, the record labels required us to shut down the original Playlist service..."